Hyatt Regency Houston is a 30-story high-rise hotel located in downtown Houston, Texas, United States. The hotel, part of the Hyatt hotel chain, was designed by architectural firm JV III and was opened to guests in 1972. At 401 ft (122 m), Hyatt Regency Houston is the city's tallest hotel The hotel is topped by a revolving restaurant known as "Spindletop". The hotel's 30-story atrium, one of the highest in Texas, was featured as a set in the 1976 film Logan's Run. KBR Tower (formerly the M. W. Kellogg Tower) is a 550 ft (167.6m) tall skyscraper in Downtown Houston, Texas, United States; it is a part of the Cullen Center complex. The KBR Tower has the headquarters of KBR. The 40 story building has about 1,047,748 square feet (97,339.0 m) of rentable office space. 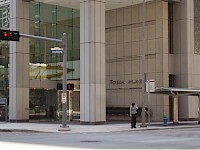 The design architect was Neuhaus & Taylor, the general contractor was Linbeck Construction Company, the mechanical engineer was Sam P.
Total Plaza, formerly the Entex Building, Louisiana Place, and the United Gas Building, is a tower in Downtown Houston, Texas, one block away from the Allen Center complex. The building, managed by Brookfield Properties, opened in 1971. The 35 story building, designed by the architect Lloyd, Morgan & Jones, was renovated in 1981 and 1996, and features a mirror-finished reflective glass on its exterior. Each floor has about 24,000 sq ft (2,200 m), with a total of 847,200 sq ft (78,710 m). 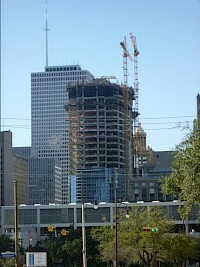 MainPlace is a 630 ft (192 m) tall skyscraper under construction in Downtown Houston, Texas. 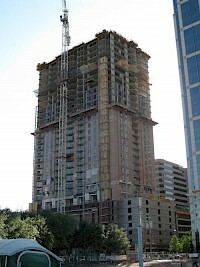 It will be completed in 2010 and have 46 floors. It has been pre-certified Silver LEED. When it is completed MainPlace will become the 15th tallest building in Houston and will feature a skygarden on the 39th floor. It is the tallest building built in Houston in 23 years, after the Heritage Plaza was completed in 1987. 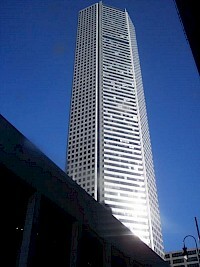 One Allen Center is a 452ft (138m) tall skyscraper in Houston, Texas. It was completed in 1972 and has 34 floors. It is the 31st tallest building in the city. One City Centre is a 410 ft (125 m) tall skyscraper in Houston, Texas, USA, made from glass, steel, and concrete It was completed in 1960. It has 32 floors and is the 41st tallest building in the city. Originally called the First City National Bank Building, One City Centre is the first high modern office building built in downtown Houston. 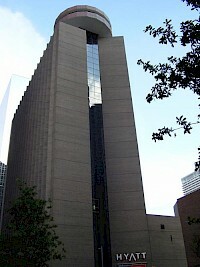 One Houston Center is a 46-story office building located in Houston, Texas. It was built in 1978 and is located at 1200 block of McKinney Street. The building is 678 feet (207 m) tall. It was designed by Caudill Rowlett Scott. It is a part of the Houston Center complex. On November 22, 2005, Alain Robert, a French rock and urban climber nicknamed "Spider-Man", was arrested attempting to climb the building. One Park Place is a 518 ft (158 m) tall apartment building located adjacent to Discovery Green park in downtown Houston, Texas. Completed in May 2009, the building has 340 units on 30 floors with a total height of 501 feet (153 m) and 37 floors. The building has 346 apartment units. The ground floor has retail shops and restaurants, while the six floors immediately above the ground floor have secure parking.